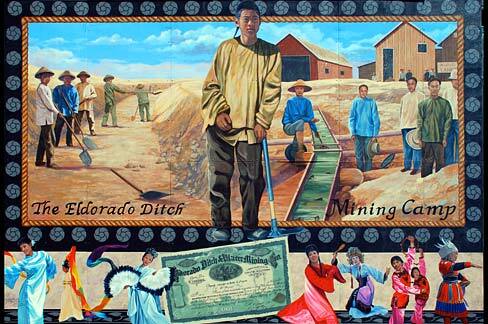 Mural in Vale, Oregon depicting Chinese workers constructing the Eldoardo Ditch. Painted by Colleen Mitchell-Veyna in 2005. 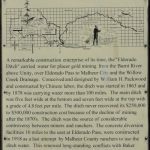 The Eldorado Ditch, also known as the El Dorado and the Big Ditch, was a system of mining and irrigation ditches constructed to supply water to the Shasta Mining District in the Willow Creek Basin area of Malheur County. Begun in 1863 for developer W.H. Packwood of Baker City, the ditch provided water to gold mines near Amelia and Malheur City, and for two boomtowns—Eldorado, twenty-six miles south of Baker City, abandoned in 1887, and Malheur City, 1.5 miles east of Eldorado. According to the Bedrock Democrat, the 135-mile-long main ditch and feeder ditches were the largest such system in the western United States. The magnitude of the project—it’s engineering, and its execution—was made possible primarily by Chinese contract laborers who began excavating large sections of the ditch in 1869. In 1870, an estimated 1,000 Chinese laborers were paid $2-$2.50 per day, $1-$2 per day below the wage paid to white workers. By 1878, they had dug one hundred miles of the ditch network. Records of water sales from 1874-1875 report proceeds of $50,000-$60,000. Water sales continued until 1911. Erosion, vegetation, and other land uses have caused ditch dimensions to vary, with its greatest measurement given as 3 feet deep, 8.5 feet wide at ground level, and 6 feet wide at ditch bottom. The ditch never recovered its $250,000 to $500,000 construction cost because of the decline of mining after the 1870’s. 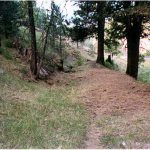 The ditch was the source of considerable controversy between miners and ranchers. The concrete diversion facilities 10 miles to the east at Eldorado Pass were constructed in 1918 as a last attempt by Malheur County ranchers to use the water. This renewed longstanding conflicts with Baker County ranchers protesting the loss of water. After a lengthy court battle, the use of the water was divided between the two counties. This made further use of the ditch impractical and it was abandoned in 1925. Eldoardo Ditch interpretive sign in Unity, Oregon.